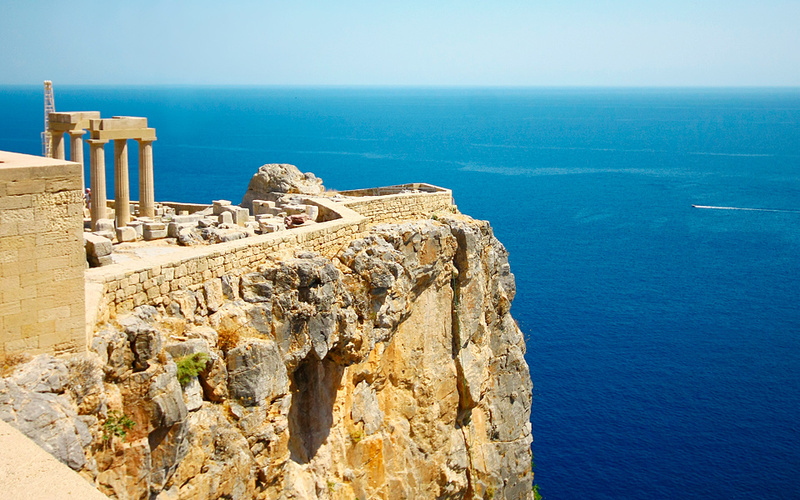 The Doric-style Temple of Athena at the Lindos Acropolis surrounded by the island's famed waters. A hotspot for visitors from the world over, Rhodes is overrun in the high season, when it’s hot, crowded and uncomfortable as people try to bank a bit of sunshine and hurry their way through the island’s fascinating history. And it is fascinating ‒ Rhodes has changed hands and allegiances more times than Madonna changes outfits in concert. The 33-meter statue built in homage to the sun god Apollo in 292 BC is long gone, but the island remains covered with the many influences it experienced. I’m not one for being outdoors amid ancient ruins when the temperature starts to climb, no matter how lovely they may be, and so to avoid the crowds and the queues, it made perfect sense to visit Rhodes in the spring, when the tourists are few and you can capture the best that the island has to offer in just two days. 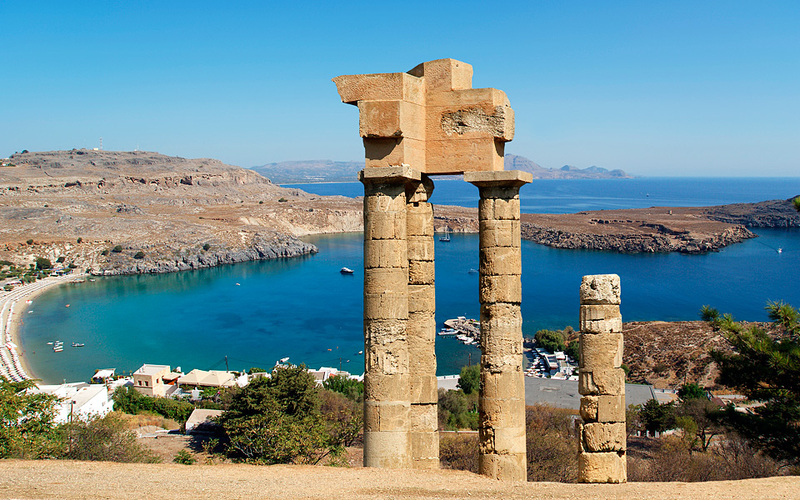 Lindos with its emblematic Acropolis and white washed houses carries a Cycladic feel. The first stop on my itinerary is the quaint little village of Lindos. The hour-long drive down the east coast from the Old Town takes you past blossoming cherry trees and sweeping olive groves. It’s a sharp contrast with the northwest coast which looks like a Costa Brava where everyone speaks Greek. No visitors used to come as far as Lindos in days gone by, but recently more have discovered this place and its beautiful beaches. In the spring, apart from a handful of tourists, it’s quiet, and the view of the bay from the village square is spectacular. 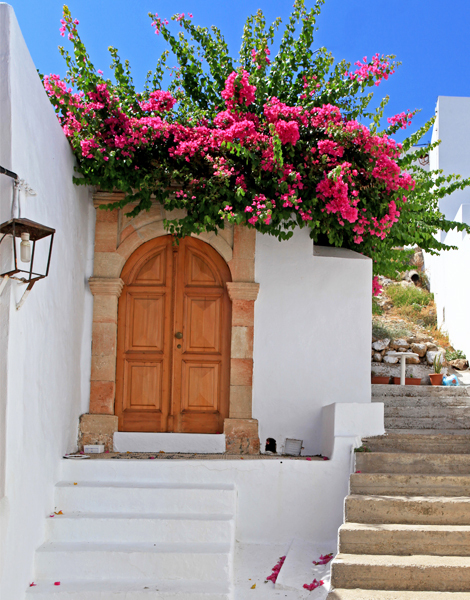 The architecture here is closer in style to Cycladic than Dodecanese, which lends a unique charm. White-washed houses sit huddled together, joined by a warren of narrow alleyways. A five euro donkey ride will get you to the Acropolis that sits on a hill at the top of the village, but in the gentle spring sun, the 10 minute walk is not too bad and the view from the top is definitely worth the effort. Once at the top, we have the whole place to ourselves. The walls surrounding the Acropolis are the remnants of the Knights Headquarters built here in the 14th Century. Hellenistic, Roman, Byzantine and Ottoman influences can be observed in the various structures that survive, but the most notable ones are the Hellenistic Stoa (200 BC) and the Doric-style Temple of Athena of Lindos (around 300 BC). 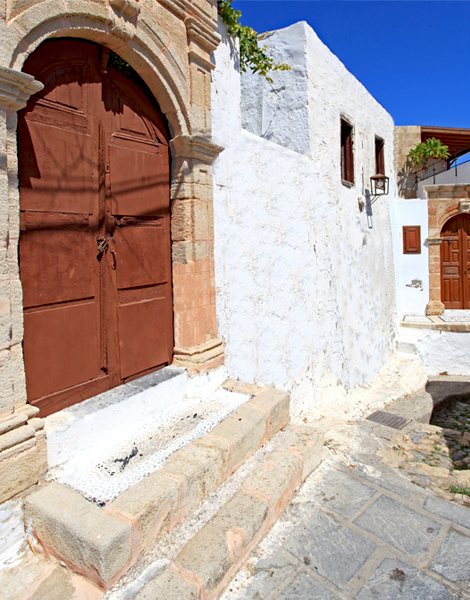 Walking back towards the village, I admire the arched wooden doors of the local houses, set in stone cladding, as well as the intricate Byzantine hohlaki pebble floorings which combine white and black stones to create decorative motifs. The village is home to several old mansions owned by captains, one of which houses a bar called Captain’s House. It’s run by Savvas Kornaros, whose wife Athanasia Sakkas inherited it from her mother ‒ here, property passes from mother to daughter ‒ and who is an expert on the village’s history and traditions. Visitors can admire the well-preserved 17th century house of Captain Lambros Regas which has a very detailed painted ceiling and Lindian-style raised penga bed. The house is laid out like the interior of a ship, with a modified ship’s wheel serving as the light feature overhead. Behind the main arch separating the living room from the sleeping area there are two concealed trap doors near the ceiling where valuables were once hidden. St Paul's beach with its calm waters and shallow incline is a favorite of families. A typical Lindian house with an arched wooden doorway. Heading back towards the square, we pass the 14th century Church of the Virgin, renovated by the Grand Master D’aubusson in 1489. From the outside, it looks quite small and plain, but a glance inside reveals walls and ceilings decorated with Byzantine frescoes from 1779, a hohlaki floor of white and black pebbles in a zig-zag design, worn to shiny finish over the centuries, and an elaborately carved 17th century wooden iconostasis. Half a dozen Greek schoolchildren sit fidgeting outside the church as a choir teacher makes them recite a song for the upcoming independence day celebrations on March 25. “Again!” she barks. A chorus of little voices drones its way to perfection. Later on, I see some of those children weaving their way in and out of the narrow alleys of Lindos. Almost all the alleyways are too narrow for a car to drive down. It’s quiet, and you can hear any vehicle coming down the alley for a good way off. The children play in safety, chatting and peeling oranges against a solitary whitewashed tree that pops out where the alleyways converge, their schoolbags resting against the trunk. It makes me feel that, grumpy choir teachers aside, Lindos must be a truly magical place to grow up. 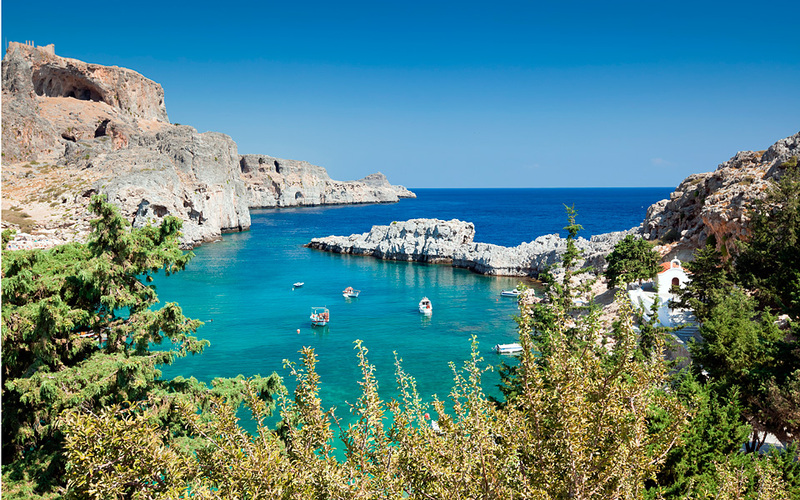 From Lindos, we head to the village of Embonas where islanders go for the best meat. We stop at the Tavern-Grill Manolis Bakis, where, along with goat kebabs and Cyrpiot-style seftalia, I discover why Rhodes is so famous for its delicious dolmadakia and lahanodolmades. 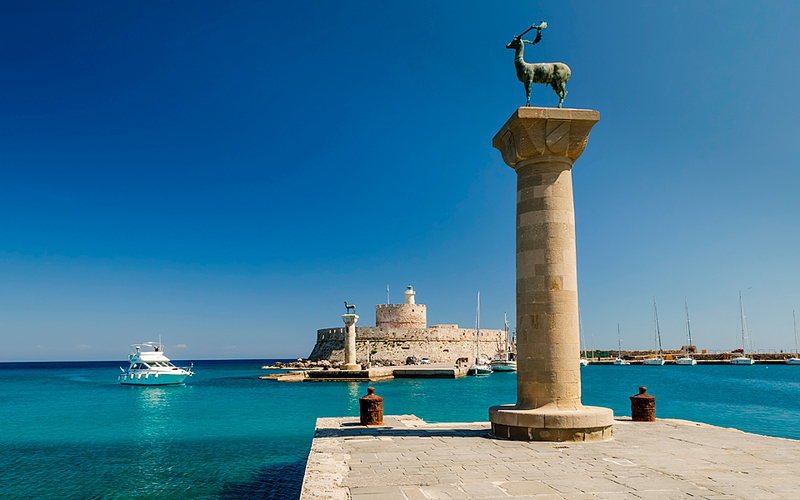 The Rhodian Fallow Deer, considered for many years one of the island’s symbols, graces the city's old harbor, Mandraki. I put on my walking shoes and head out to explore the Old Town, a UNESCO World Heritage site as of 1988. Off-season, it’s practically deserted. The Old Town unfolds like a labyrinth and gives the sense of having a life of its own. The epicenter of the island’s history, it’s haunting, and allegedly haunted. It’s easy to get lost here, and you won’t really mind as you wander past cats and grannies sunning themselves in open windows, stumbling onto hidden churches and exploring along walls with fragrant jasmine vines spilling over them. There are nine gates leading into the Old Town, which is divided into several quarters, including the Knight’s Quarter, the Hora, sometimes called the Turkish Quarter, and the Jewish Quarter. The Avenue of the Knights (Ippoton) was once home to the Knights Hospitaller of St John. The Avenue of the Knights (Ippoton) was once home to the Knights Hospitaller of St John who settled here after being expelled from Palestine and Cyprus in the early 14th century. The Palace of the Grand Masters itself, an imposing building with a lavish interior, is a sight not to be missed. A short walk away is the Hora with its distinctive pink-domed Mosque of Suleyman, built in 1522 and a beautiful example of Ottoman architecture. The mosque operates as a museum and is in the process of being restored. Set in the embrace of the Old Town, it doesn’t look at all out of place. There is something about the Old Town which I end up absolutely adoring. So much of the island’s history happened in these streets, and they reverberate with their untold stories. The main streets are a mishmash of the hyper-touristic shops that epitomise a tourist hotspot, many still mercifully shut at this time of year, but beyond them, down the side streets and skirting along the city’s grand old walls, you get the sense of the old and new, rich and poor, godless and holy, luxurious and decadent, tragic and beautiful all crammed together into this small area. Megalou Alexandrou Square, 85100, Rhodes Tue-Sun: Off-season 08:00-14:40, Summer: 08:00-16:00 | Mondays closed Tel: (+30) 22413.65.200, (+30) 22413.65.257 Tickets: Full € 6, Reduced € 4 A special ticket of € 10 is also available which will get you into several sites, including the Palace of the Grand Masters. 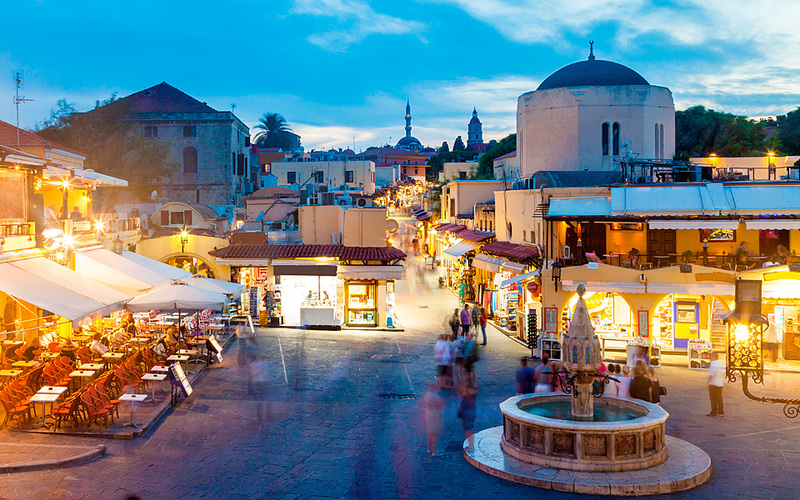 A view of the Old Town of Rhodes, a UNESCO World Heritage site. By the early evening, we are all walked out and in need of a sugar boost. So we head to the patisserie Stani. Getting there from the Old Town involves crossing a path over the moat of one of the gates, where, if you time it right, you can enjoy a brilliant sunset. Stani has a cult following with locals and in-the-know tourists for their ice cream which is made using fresh milk from the island’s dairies. Their vanilla flavor particularly gets rave reviews. Equally famous is their chocolate tsoureki, and I can see why. To avoid the tourist-trap eateries, we ask the locals where they eat, and head to Locanda on their advice. Here, we enjoy excellent local wine and crusty bread dipped in vibrant green olive oil. If imam baildi is one of the day’s specials, you should definitely order it. 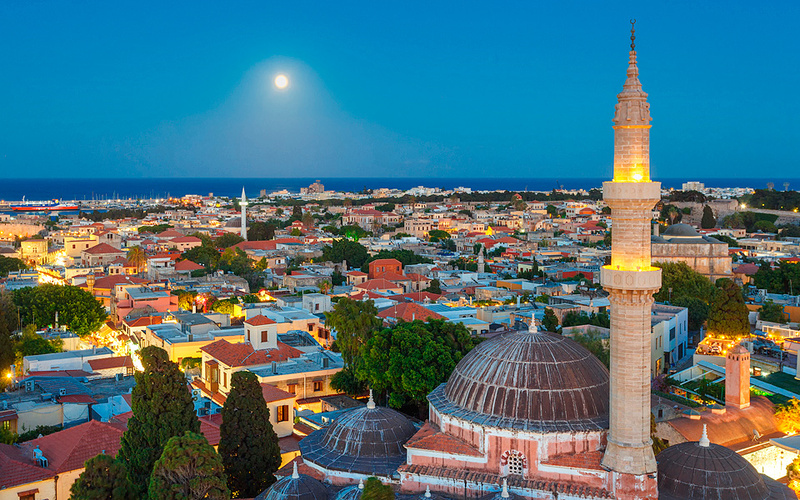 The tourist season in Rhodes runs from late March to October. If you visit at the start of it, you might not find as many shops open, and you may need to bring a jacket along for the spring breezes. But when you walk up to the railings of the tiny main square of Lindos to enjoy the view accompanied by the scent of the orange trees blossoming just below, and when you lose yourself in the encompassing silence of the Old Town, you’ll discover for yourself the charm of Rhodes free from the heat and crowds of the high season. 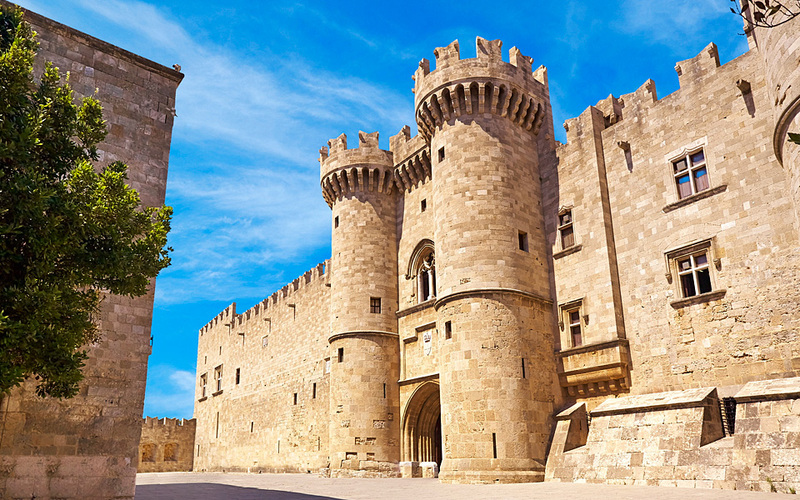 Rhodes can be accessed from Athens International Airport by flights operated both by Aegean Airlines and more recently Ryanair, as well as regular ferries from the port of Piraeus. 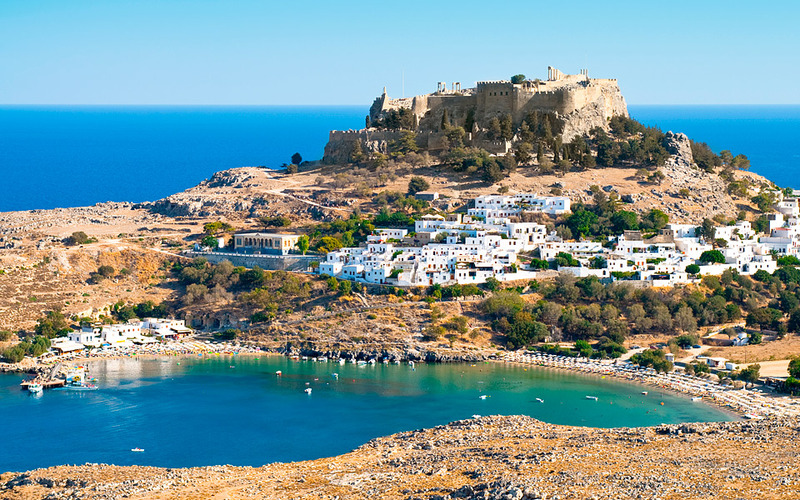 Lindos can be accessed by taxi, which costs about € 65 if you choose not to rent, and regular buses run from the KTEL bus stop at Rimini Square in Rhodes Town, costing €5.50 one-way.